1. Arrange salmon over bottom of 13x9" baking dish. Combine remaining ingredients in small bowl and pour over salmon Turn salmon to coat with marinade. Cover and refrigerate for 30 minutes. 2. Meanwhile, preheat oven to 425°. 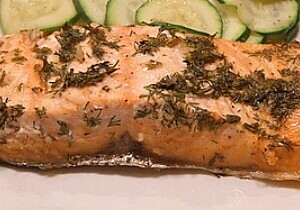 Drain off excess marinade from salmon. Bake 10-12 minutes, depending on thickness of fish. Fish will flake easily and be opaque in center.